BACKGROUND: Maternal and offspring immediate and long-term health are affected by pregnancy weight gain and maternal weight. This study was designed to determine feasibility of: 1) recruiting a socio-economically and racially/ethnically diverse sample of pregnant women into a longitudinal observational study, including consenting the women for serial biologic specimen evaluations; 2) implementing comprehensive assessments (including biologic, anthropometric, behavioral, cognitive/psychosocial and socio-demographic, and cultural measures) at multiple time points over the study period, including collecting biologic specimens at planned and unplanned pregnancy delivery times; and 3) retaining the sample for one year into the postpartum period. 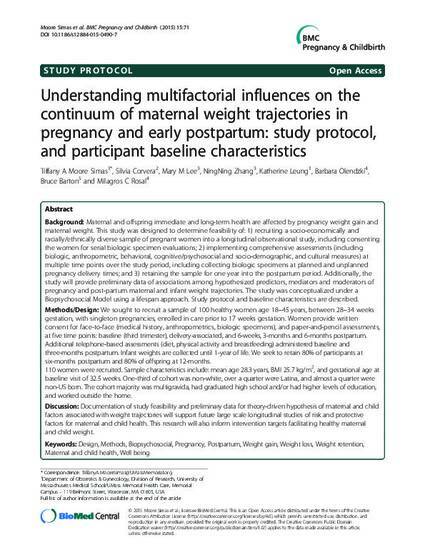 Additionally, the study will provide preliminary data of associations among hypothesized predictors, mediators and moderators of pregnancy and post-partum maternal and infant weight trajectories. The study was conceptualized under a Biopsychosocial Model using a lifespan approach. Study protocol and baseline characteristics are described. METHODS/DESIGN: We sought to recruit a sample of 100 healthy women age 18-45 years, between 28-34 weeks gestation, with singleton pregnancies, enrolled in care prior to 17 weeks gestation. Women provide written consent for face-to-face (medical history, anthropometrics, biologic specimens), and paper-and-pencil assessments, at five time points: baseline (third trimester), delivery-associated, and 6-weeks, 3-months and 6-months postpartum. Additional telephone-based assessments (diet, physical activity and breastfeeding) administered baseline and three-months postpartum. Infant weights are collected until 1-year of life. We seek to retain 80% of participants at six-months postpartum and 80% of offspring at 12-months. 110 women were recruited. Sample characteristics include: mean age 28.3 years, BMI 25.7 kg/m(2), and gestational age at baseline visit of 32.5 weeks. One-third of cohort was non-white, over a quarter were Latina, and almost a quarter were non-US born. The cohort majority was multigravida, had graduated high school and/or had higher levels of education, and worked outside the home. DISCUSSION: Documentation of study feasibility and preliminary data for theory-driven hypothesis of maternal and child factors associated with weight trajectories will support future large scale longitudinal studies of risk and protective factors for maternal and child health. This research will also inform intervention targets facilitating healthy maternal and child weight.